As the #MeToo movement surges, let me propose Tosca as its poster child. Floria Tosca is the fictional heroine in the tragic opera named after her. She’s a beautiful diva stalked and sexually harassed by Baron Scarpia, Rome’s chief of police. All this takes place during the Napoleonic era with horrific consequences. Giacomo Puccini’s masterpiece premiered in Rome on Jan. 14, 1900. A new Metropolitan Opera production will be streamed live to Fort Lewis College at 11 a.m. Saturday. Don’t miss it. Consider it part of your #Time’sUp schedule. The opera takes place on a specific day, June 17, 1800, for historical reasons. Rome was under threat of a Napoleonic occupation, and an underground resistance has been organized. In Act II, news of Napoleon’s victory is suddenly announced, and that changes everything. The French victory ratcheted up Bonaparte’s plan to declare himself emperor of France and conquer all of Europe. High stakes, indeed. Actually, June 17 was two days after the historic Battle of Marengo when Napoleon’s army defeated the Austrians. It would have taken a few days for news to travel to Rome. So reasoned the French playwright, Victorien Sardou, whose 1887 melodrama “La Tosca” factored in a delay. Puccini followed suit. On the day Napoleon’s victory is confirmed, the fictional Tosca has a more personal vendetta in mind. Earlier, Scarpia had captured, tortured and murdered her lover, Mario Cavaradossi, a member of the resistance. Tosca could have led a protest march across the Ponte Sant’ Angelo objecting to workplace misconduct. Instead, she took more direct action against her nemesis. Tosca kills Scarpia, and then honoring an old operatic tradition, commits suicide. Tosca jumps off the roof of the Castel Sant’ Angelo where Scarpia’s lavish apartments are the setting for his seduction. The Castel might be Rome’s own Mar-a-Lago, second only to the Farnese Palace. Tosca wasn’t Stormy Daniels, but I rest my case for Tosca as a #MeToo poster child. 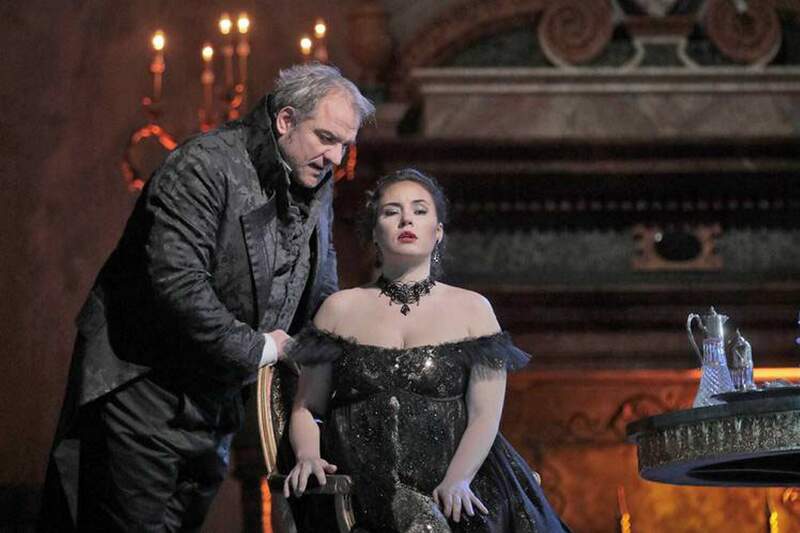 The new Met production has been designed by Sir David McVicar and stars Sonya Yoncheva as Tosca, Vittorio Grigolo as Cavaradossi and Željko Lucic as Baron Scarpia. Lucic is a Serbian bass-baritone who made his Met debut in 2006 and portrayed Scarpia in 2015. Ah yes, Baron Scarpia, my favorite operatic villain and nickname of the worst boss I ever had. The time, place and particulars will remain a mystery. But colleagues who worked with me back in the day will remember Scarpia for his smarmy comments, oily presence and predatory behavior. Of course, he thought he was charming. But, alas, he was transparent. So, the women on staff and in the faculty lounge nicknamed him Scarpia. Back in 1887, “La Tosca,” Victorien Sardou’s melodrama, became a European sensation. Written for Sarah Bernhardt, it was all the rage in Paris when it opened then played in London and all over Italy. The aging Giuseppe Verdi regretted he was too old to turn the play into an opera. Puccini, 42 at the time, saw it twice, in Milan and Turin. He decided to get the right for an opera. After complex negotiations, he and his co-librettists, Luigi Illica and Giuseppe Giacosa, did. Twelve years later, “Tosca” premiered in Rome. Read Tosca’s Rome, a well-researched book by Susan Vandiver Nicassio, for more details. Nicassio uncovers dozens of historical sources behind Sardou’s French play and Puccini’s Italian opera. The live transmission will start at 11 a.m. Saturday at Fort Lewis. Sung in Italian with English subtitles, the performance runs three hours and 35 minutes with two intermissions. What: The MET: Live in HD presents Giacomo Puccini’s “Tosca.” Based on the French play, “La Tosca,” by Victorien Sardou, with Sonya Yoncheva as Tosca, Vittorio Grigolo as Cavaradossi and Željko Lucic as Baron Scarpia, in a new production designed by Sir David McVicar, conducted by Emmanuel Villaume. Tickets: $23 general, $21 seniors, students and MET members, available online at www.durangoconcerts.com, by phone at 247-7657, at the Welcome Center at Eighth Street and Main Avenue or at the door. Note: Surcharges may apply. More information: Running time: three hours 35 minutes.